In a comparison of SSH publication patterns across eight countries, authors show that the use of language and publication types are influenced by each country’s cultural and historic heritage. Authors collected data on all peer-reviewed SSH publications and specifically for the disciplines of economics and business, law, and philosophy and theology for the Czech Republic, Denmark, Finland, Flanders (Belgium), Norway, Poland, Slovakia, and Slovenia. No previous study has brought together data from such a wide range of comprehensive coverage national bibliographic databases. With data on 272,376 peer-reviewed publications from the period of 2011–2014 analyzed, the study provides unique insight into the difference in publication patterns between and within fields. We observe that the publication patterns are stable and quite similar in West European and Nordic countries, whereas in Central and Eastern European countries the publication patterns demonstrate considerable changes over time. 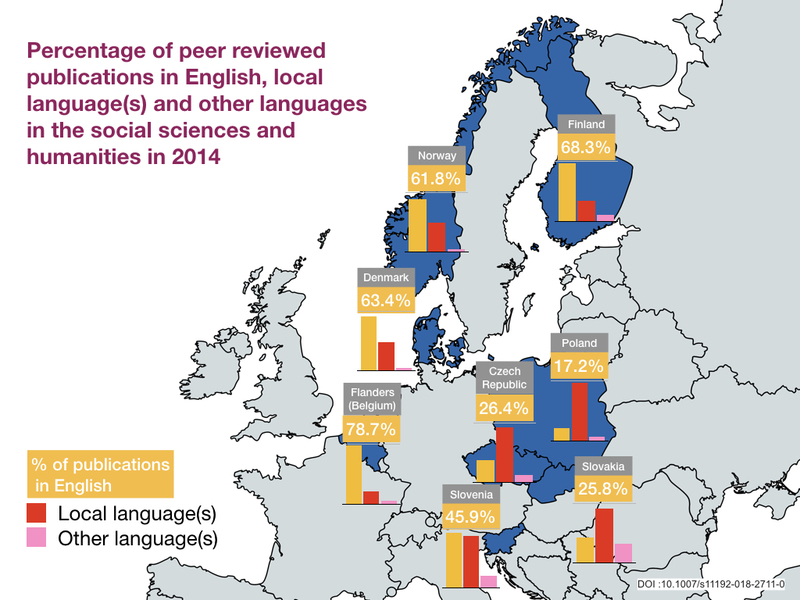 In all countries, the share of journal articles and the share of publications in English is on the rise.